When adding the finishing touches to your home restoration project, consider adding wood corner guards to the edge of your walls for a period look. Corner Guards, also known as edge protectors, wall corner guards, corner bead, or corner round molding, protects corners from unsightly dings, chips and wear, while giving an instant period appeal. Van Dyke’s Restorers offers these Made in the USA, hard-to-find pieces in several styles, wood species and lengths including the Country Corner, Traditional, Contemporary, and Flat End. The Country Corner Guard features be autiful millwork with multiple shapes. The Traditional Corner Guard has a rounded body with finial-like ends, while the Contemporary Corner Guard is a V-shaped model that has its roots in Victorian style. The Flat End Corner Guard has a rounded shaft with straight cut on the bottom wand a finial style top. Woods types include Hardwood, Oak, and Cherry with lengths of 22”, 32”, 42”, 48” and 54”. 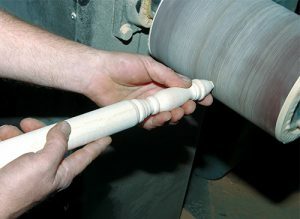 These beautiful wood corner guards are precision machine lathed and then hand finished for quality that is unsurpassed.